The Ring-billed Gull is probably the most numerous gull in North America and perhaps more abundant today than ever before. An amazingly adaptable and opportunistic bird, it is equally at home nesting on natural islands or on human-made breakwaters, piers, and waste grounds. The Ring-billed Gull will nest on sand, soil, concrete, slag, boulders, driftwood, or rubble—as long as there is water and food nearby. Like most other gulls and terns, Ring-billed Gulls nest in colonies. They are social birds requiring only a small territory, and their colonies usually contain hundreds or, more often, thousands of pairs. The minimum size of long-established gulleries is 500 to 1 000 pairs. The maximum size varies geographically: in the west, the largest colonies are 8 000 to 10 000 pairs and in the east, they are more than double that at 20 000 to 30 000 pairs. The largest colony is undoubtedly Little Galloo Island in the United States portion of Lake Ontario, with numbers estimated as high as 82 000 pairs. Newly founded colonies often contain up to 50 pairs and either grow rapidly or fail to become established. 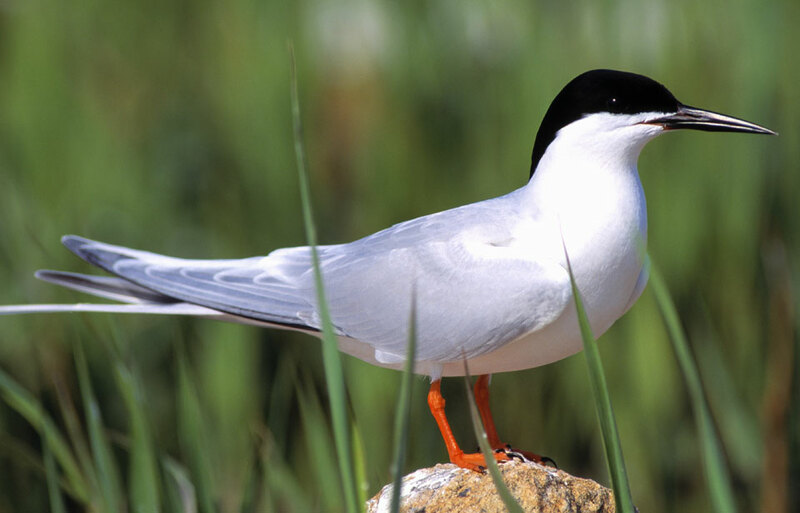 Other birds that often establish colonies with Ring-billed Gulls include ground-nesting Herring Gulls and Common and Caspian Terns and tree-nesting Great Blue and Black-crowned Night Herons. Double-crested Cormorants, which nest both in trees and on the ground, occasionally nest with Ring-billed Gulls, as will California Gulls and white pelicans. Each year Ring-billed Gulls spend many months in Canada, but they are most often seen by city dwellers from August to October. When the year’s crop of young birds is flying and before migration has begun, the gulls congregate in large numbers at garbage dumps, golf courses, zoos, parks, fishing ports, stadiums, marinas, drive-ins, and school yards. This provides city people with a good opportunity to study their activities and local movements. 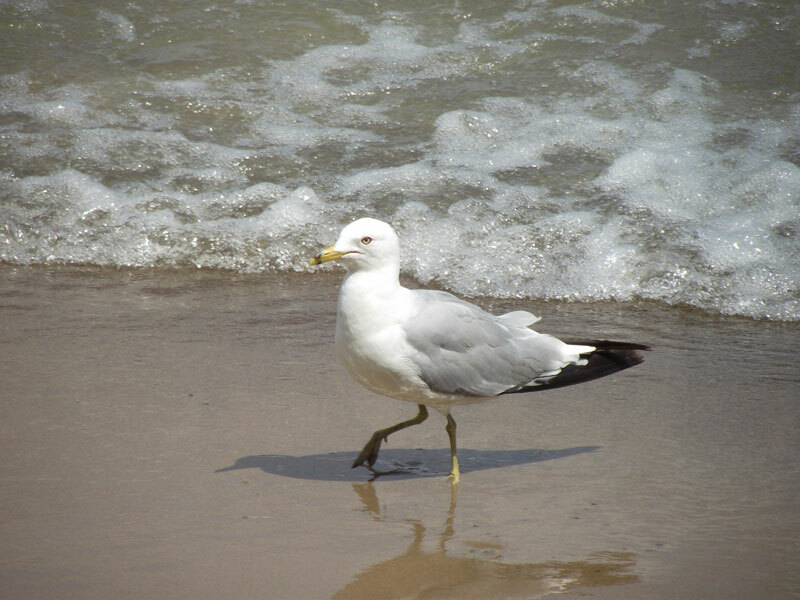 The gulls spend their nights at a common roost, usually on a lake, a river or a breakwater where they are safe from mammalian predators and from human disturbance. During the last one or two hours of daylight and again in the morning they can be seen commuting between their daytime feeding and loafing sites and their night-time roosts. 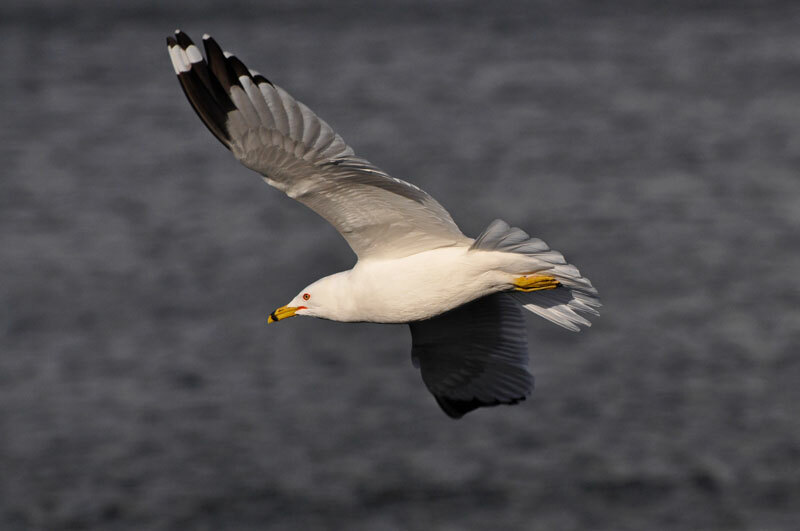 The great adaptability and the protected status of the Ring-billed Gull have contributed to the tremendous explosion of its numbers in the last few decades. The population on the Great Lakes, estimated at 3 000 pairs in 1930, increased to over 300 000 pairs in 1967 and is probably still growing. 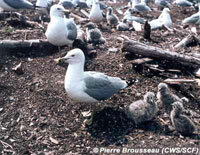 In 1973 some 20 pairs of Ring-billed Gulls started nesting in Toronto Harbour on a headland constructed of dredged spoil. Four years later there were over 20 000 nesting pairs. 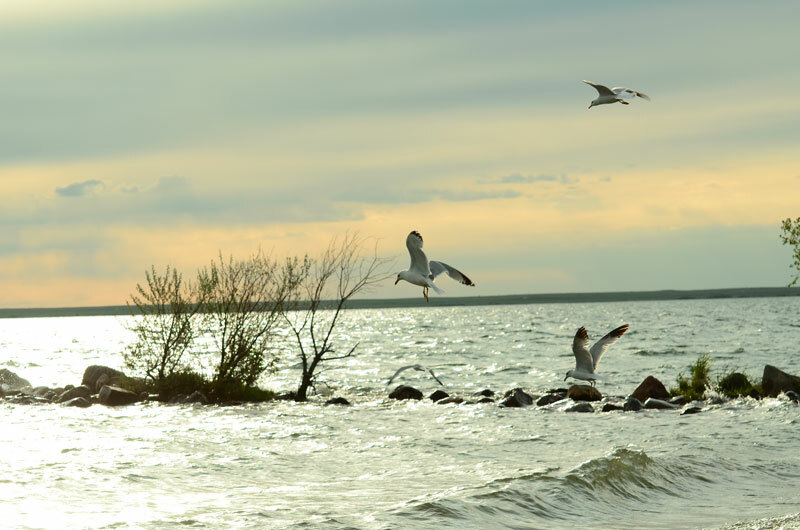 Banding studies have shown that the birds had been recruited from at least 17 other colonies on the Great Lakes. A similar growth pattern occurs in western Canada. In Alberta, for instance, Ring-billed Gull numbers have increased from 20 000 pairs in 1968 to nearly 40 000 pairs in 1977. During those nine years, a colony on Miquelon Lake near Edmonton had grown from 750 pairs to over 10 000 pairs. 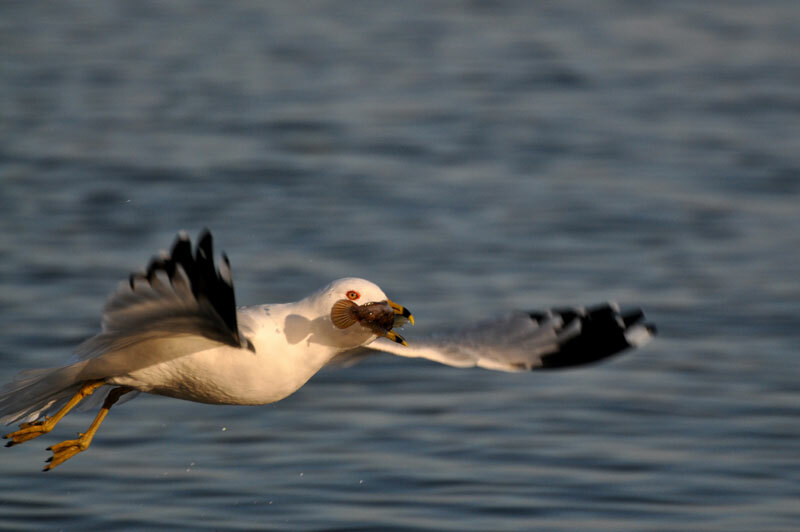 In the last 50 years or so, Ring-billed Gulls have reoccupied most of their former breeding territory in the northern United States and southern Canada. They nest most abundantly on the Great Lakes and in the Prairie provinces. British Colombia, New Brunswick, and Prince Edward Island each has only one small colony, and there are no colonies in Nova Scotia. 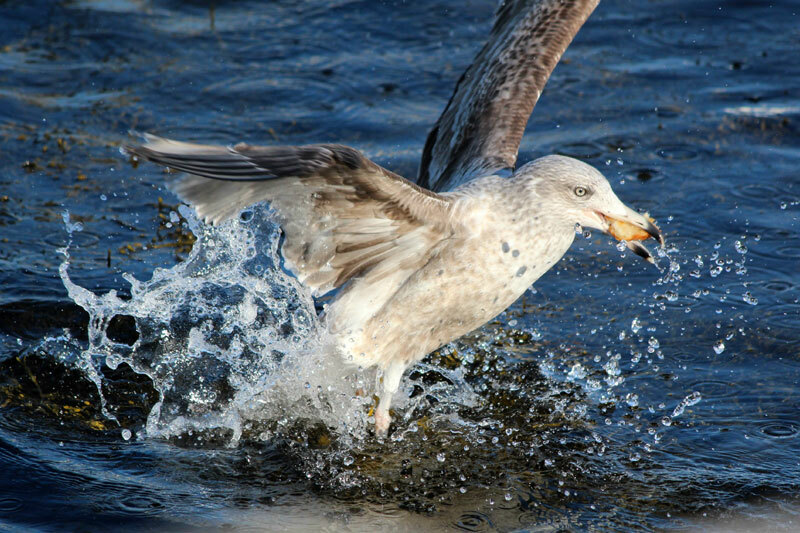 There are several colonies in Newfoundland, where the numbers of Ring-billed Gulls are increasing. Data from bird banding studies, or tracking birds by placing numbered bands around their legs, have shown that there are two main wintering areas for Canada’s Ring-billed Gull populations. During September, October, and early November, those that nest west of the Great Lakes migrate to wintering areas along the Pacific coast of California and Mexico; those that nest on the Great Lakes and further east winter along the coast of the Gulf states, primarily Florida. A small percentage of Canadian Ring-billed Gulls winter on the Great Lakes, usually near open water on lakes Erie and Ontario and the Niagara River. Some of these gulls will have bred on the Great Lakes, others as far north as James Bay. 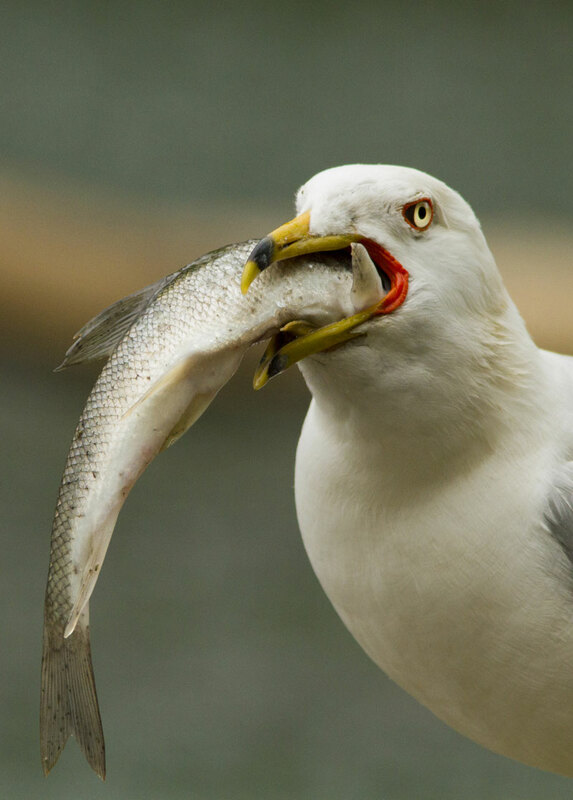 The diet of Ring-billed Gulls is variable. 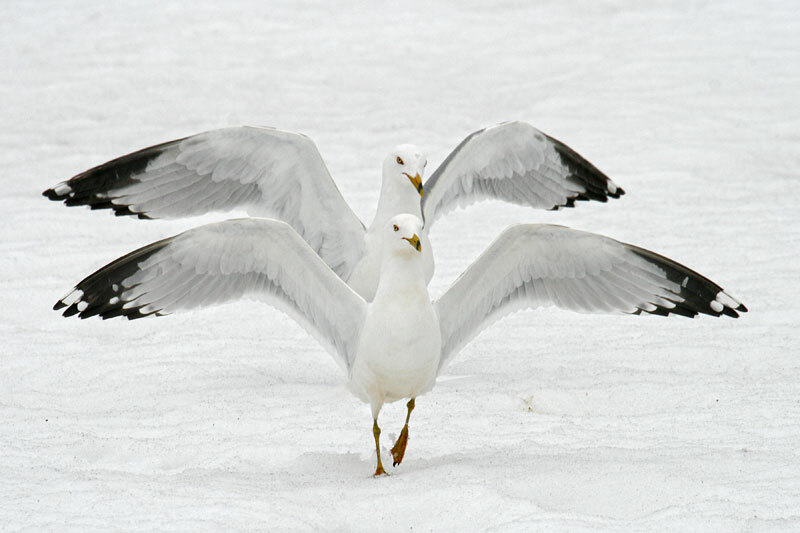 These gulls are opportunistic feeders that readily switch from one type of food to another if the second type becomes more abundant. During the spawning season they will feed primarily on smelt; after a rain they seek out earthworms; during farmers’ ploughing and harvesting seasons they feed on insect larvae and mice. At other times of the year they will feed on road kills, flying insects, and the young of other birds, especially small ducklings. They can even be found waiting at school yards for hand-outs from children’s noon lunches. In eastern Canada where spring comes earlier than on the prairies, migrating Ring-billed Gulls begin to arrive on the breeding colonies in late February or early March. On the prairies they do not arrive until late March or early April. After their arrival the gulls spend nearly a month establishing territories, engaging in courtship rituals and building nests out of plant materials (grass and twigs), a few feathers, and odds and ends. They lay a clutch of three eggs beginning in April in the Great Lakes area and in early May on the prairies. Ring-billed Gulls incubate, or warm, the greenish-brown splotched eggs for approximately 25 to 27 days until they hatch. 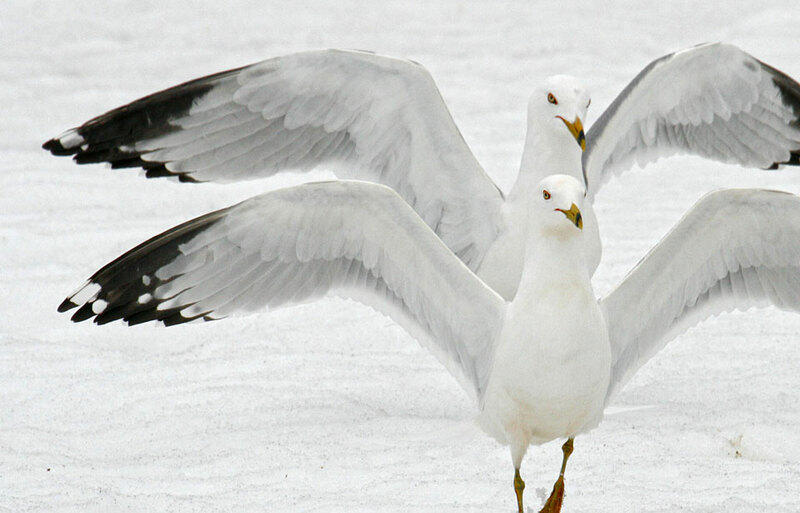 Ring-billed Gulls are capable parents. They take turns incubating the eggs and, on the average, will sit on them for more than 59 minutes out of every hour. Although usually more than 80 percent of the eggs hatch, many gull chicks die soon afterwards. However, Ring-billed Gulls do better than many gull species and will often raise two chicks to flying age—five to six weeks. This high reproductive success coupled with a life span of 10 to 15 years has contributed to the current gull population explosion. Gulls do not normally have many natural predators; nesting on islands or in marshes safeguards their nests from most land predators. However, if water levels decrease during the nesting season so that an island becomes a peninsula, or if the water surrounding a nesting colony is not too deep, some land predators may reach the colony. Coyotes, foxes, dogs, raccoons, mink, rats and other mammals will kill and eat gulls and their eggs if they can get to them. For certain other predators, water levels are not a hindrance. Winged predators like the Great Horned Owl will attack and kill gulls at night. In the late nineteenth century white bird feathers were in great demand as adornments for hats and gowns of fashionable ladies. 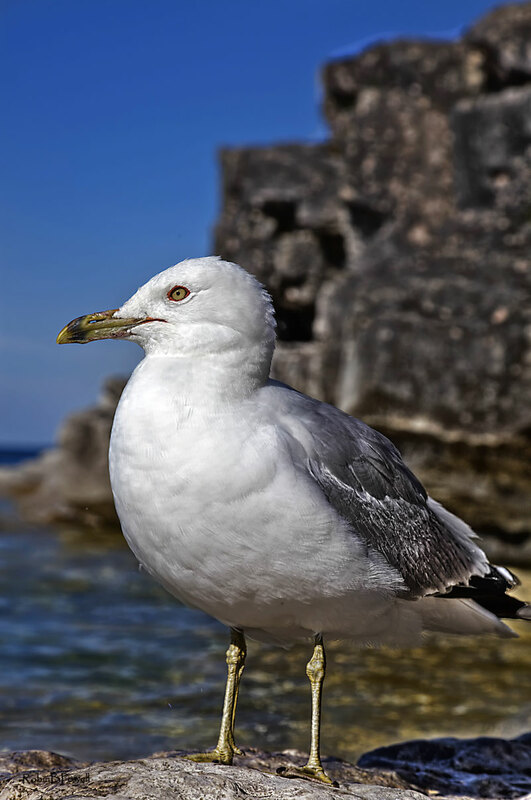 As a result, the Ring-billed Gull, once abundant enough to be named the "Common American Gull," suffered a drastic decline, along with other species of gulls, terns, and herons. The Ring-billed Gull was not to be persecuted for long. Protected in 1916 under the Migratory Birds Treaty between Canada and the United States, it staged a spectacular comeback, first slowly but later more rapidly. Today the Ring-billed Gull is the gull that most Canadians are likely to see, and the recent increase of its numbers has made this species a nuisance. This continent-wide population explosion, which is only partially understood, has created a number of management problems. Garbage dump workers, farmers, airport officials, boat and cottage owners, zoo keepers, and others report serious health hazards and fouling of equipment from the accumulation of gull droppings. Massed local gull flights near airports as well as gulls hanging around on runways increase the risk of bird-strike collisions between one or more birds and an aircraft. A bird hitting a windshield or sucked into an engine of a fast-moving jet airplane can cause serious damage to the plane, even causing it to crash. 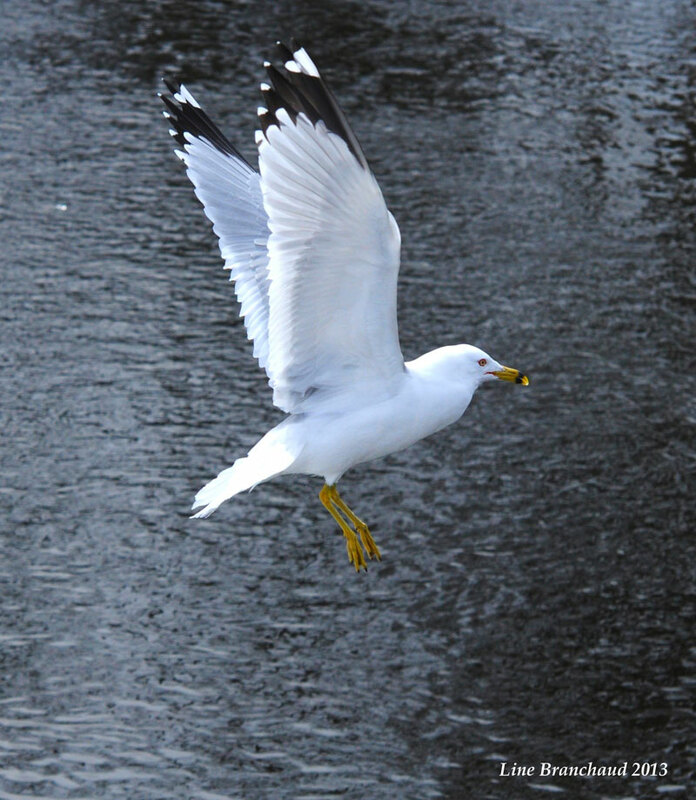 Major strikes involving Ring-billed Gulls have occurred at Montreal, Toronto, and New York in the autumn and at Miami in the winter. In many areas the Ring-billed Gull is displacing the Common Tern in mixed colonies. The tern is considerably smaller than the Ring-billed Gull and returns to its nesting grounds a month later than the gull. With their annually increasing numbers the gulls tend to occupy all, or most, of the available nesting sites in any area. Later, when the terns arrive, only a few are able to find good nesting sites. Some of the others will try to nest in less suitable habitat, but usually without much success. Others must forgo breeding altogether for that year. It has been encouraging to see the Ring-billed Gull recover from its low population levels of 50 years ago. On the other hand, it has been discouraging to see its numbers reach a level where it has become a pest and a management problem. 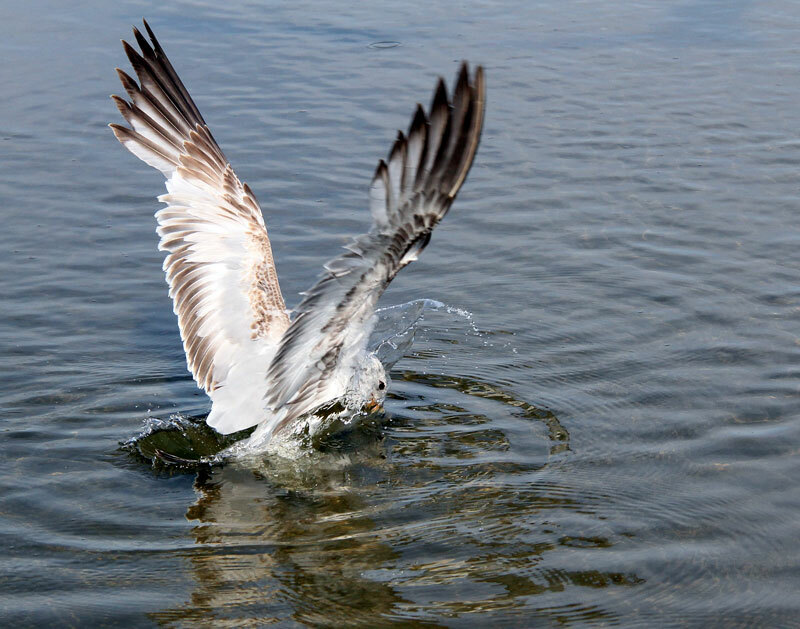 The Canadian Wildlife Service is involved in studies to determine what should and can be done to manage the runaway Ring-billed Gull population. 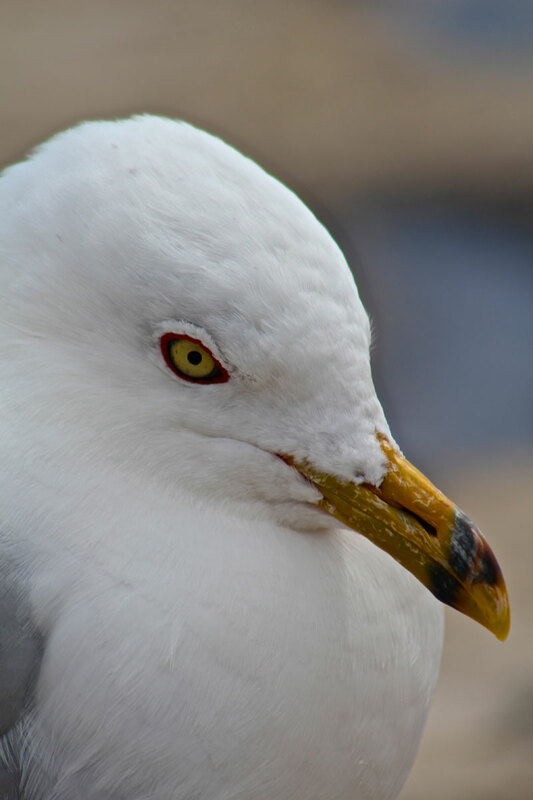 Because the enormous increase in gull numbers is largely the result of inadvertent human-made changes in the birds’ environment, perhaps deliberate changes will be needed to protect other species against the impact of Ring-billed Gulls. Canadian Wildlife Service. 1975. Gull seminar proceedings. Canadian Wildlife Service, Sackville, New Brunswick. Costello, David F. 1971. The world of the gull. Lippincott Co., Philadelphia and New York. Darling, L. 1965. The gull’s way. William Morrow and Co., New York. Godfrey, W.E. 1966. Birds of Canada. National Museums of Canada, Ottawa. Graham, F., Jr., 1975. Gulls. A social history. Random House, New York. Schreiber, E., and R.W. Schreiber. 1975. Wonders of sea gulls. Dood Mead and Co., New York. Vermeer, K. 1970. Breeding biology of California and Ring-billed Gulls: a study of ecological adaptations to the inland habitat. Report Series Number 12. Environment Canada, Canadian Wildlife Service, Ottawa. © Her Majesty the Queen in Right of Canada, represented by the Minister of the Environment, 1979. All rights reserved.